The Sony Centre opened as the O’Keefe Centre on October 1, 1960, and has played host to a tremendous variety of international attractions and stars. The theatre, designated a historical site by the City of Toronto, recently underwent extensive renovations that restored the elegance and grandeur of the original O’Keefe Centre. Iconic features such as the theatre’s marquee canopy and York Wilson’s lobby mural “The Seven Lively Arts” were preserved. Restoration of the wood, brass and marble that were hallmarks of the original facility were undertaken, along with audience seating and flooring upgrades, new washrooms, and re-configured lobby spaces. A group can be made up of friends, family, co-workers, employees, students, clubs, etc. Our group minimums are set by our producers and generally range from 8 to 20 tickets. Please do not hesitate to contact a Group Sales Consultant at 647-438-5559 or Toll Free 1-866-447-7849 to find out what a particular show’s group minimums are. HOW DO I ORDER THE TICKETS FOR MY GROUP? Call THE Group Tix Company at 647-438-5559 or Toll Free at 1-866-447-7849 or email us at info@thegrouptixcompany.com. The office is open Monday through Friday 9am to 5pm EST. WHAT IF MY GROUP WANTS TO SIT IN DIFFERENT PRICE LEVELS? That is fine. We can sit your group throughout the theatre in different price ranges. One of our Group Sales Consultants can assist you in finding the perfect seats. If any of your group has trouble walking up stairs, you should place an order for our Orchestra section. We do have special seating locations for patrons in wheelchairs and their companions. Please notify your Group Sales Consultant at the time of booking so we can accommodate your group’s needs. DO I HAVE TO PAY IN FULL WHEN I ORDER? We require a 20% non-refundable deposit within 30 days of reserving your seats and the final payment is due 6 weeks from the performance date. We also require final payment at the time of your order if it is less than 6 weeks from the performance date. 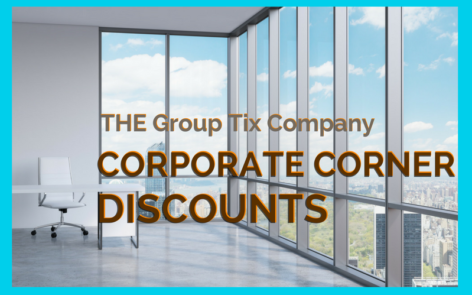 We recommend that you book the maximum number of tickets your group will need. You can reduce your order up until your final payment. If your group falls below the group minimum the prices will revert back to the single ticket prices and the single ticket service charges may apply. We accept Visa, Master Card and AMEX, company cheques and certified cheques. DO YOU OFFER ANY FREE TICKETS? Yes we do! We will give you one (1) complimentary ticket for every forty (40) paid tickets. This ticket will be issued from the lowest priced section in your order. DO WE STILL HAVE TO PAY THE TICKETMASTER SERVICE CHARGES? No you do not have to pay the individual Ticketmaster service charges. However, there is a group service charge of: $15.00 for groups of 8 or more tickets. We are happy to ship your tickets via Express Post for a minimal mailing fee, provided there is enough time before your performance date. WHAT IF THERE IS A SNOWSTORM AND MY GROUP CAN’T MAKE IT TO THE THEATRE? Please note that performances are rarely cancelled due to weather conditions. In the event that a show is cancelled, we will make every effort to reschedule your group for a different performance. WHERE CAN I PARK MY BUS? Please visit the City of Toronto’s website www.toronto.ca/transportation to see up-to-date information regarding the regulations for motor coach/bus parking. Buses may stop in front of the Sony Centre for the Performing Arts to drop off or pick up their passengers. Curbside only and please do not double park on the street.